Romantic and the epitome of springtime, peonies are among the top trending flowers for weddings. Brides love the fluffy ruffled look and full size. Peonies’ versatility allows them to be a flawless choice for almost any wedding theme including vintage, whimsical, and garden style. 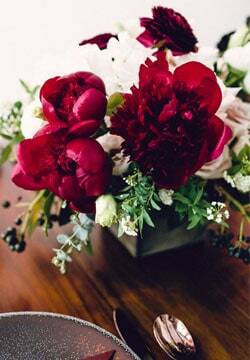 Typically a peony’s bloom spans 4-6 inches wide, making it the perfect focal flower for any bridal design. They are grown in a variety of shades ranging from white, a blush-toned white, light pink, dark pink, red, coral, and even burgundy. These versatile flowers have a vase life of up to 7 days and are a reasonably hardy flower – making them pretty easy to work with for the DIY bride. The one bad (sad?) thing about peonies? Availability! 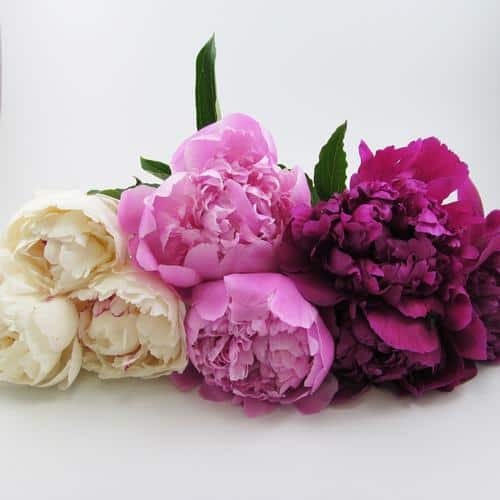 The seasonality of peonies can be very confusing, and each variety has a fairly short growing season compared to other flowers. While roses, hydrangea, and other popular wedding blooms are cultivated in controlled greenhouses in warm climates, peonies are field grown. They are at the mercy of weather patterns and seasonal changes, not to mention floods, droughts, and other catastrophes. And another twist – white peonies come into season first in a locale, and then colors follow behind. If peonies are your dream wedding flower, take a glance at when you can look forward to seeing them. When are Peonies in Available in North America? 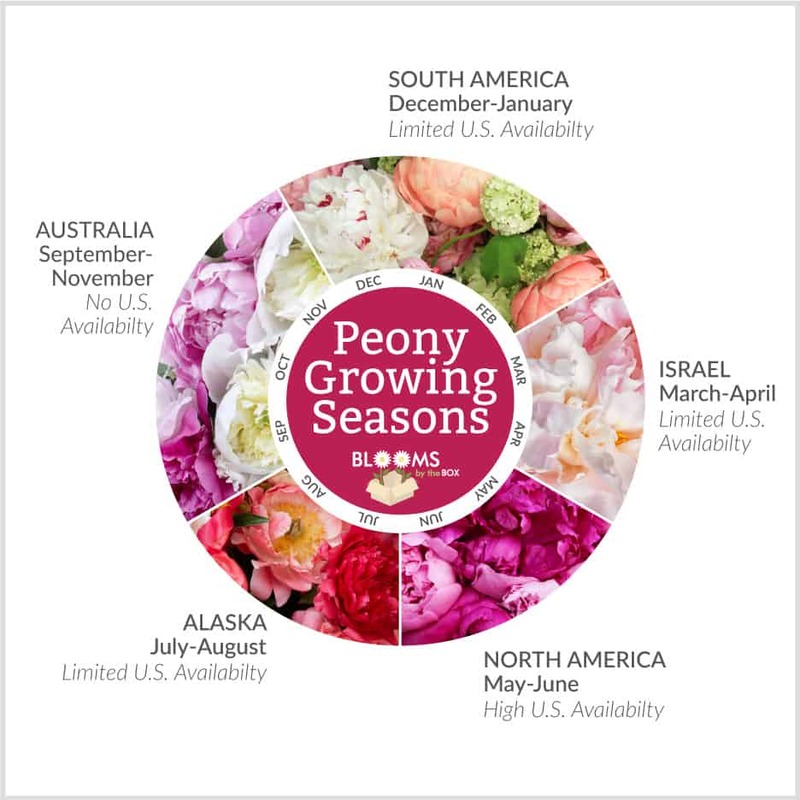 Not all months are the same… Read on for some month-by-month details about peony availability! Peonies are grown in South America during December, January, and February, where they are enjoying summer while we in the north are chilling. This is good news for brides who have planned “Winter Wonderland” weddings during and after the holiday season. Be aware that peony prices tend to increase this time of year to cover the import costs. Peonies are not grown in the Western Hemisphere during March and April – so those of us in the Americas have to turn to Israeli farms during these months. However, there are drawbacks: Often their stems are thin, and their bloom size can be compared to the size of a marble. On top of that, they are quite expensive during March and April. It may be wise to avoid peonies during March and April and perhaps substitute them with garden roses or football mums. Peony lovers in the U.S. – THESE are your months! Peonies are grown across the country from May through early July, starting in the sunbelt and working their way up to northern fields as temperatures rise. You’ll see the lowest prices, best variety and largest blooms of any time of year! July heat starts to end the North American peony season. The end of summer finds peonies very scarce, except for some limited supplies from Alaska. Like the early spring Israeli imports, though, these will be pretty pricey and not near the quality of the early summer varieties. Sadly, we have come to a time when peonies are unavailable in North America. Although peony season is in full swing in Australia, they’re not typically shipped to the US. 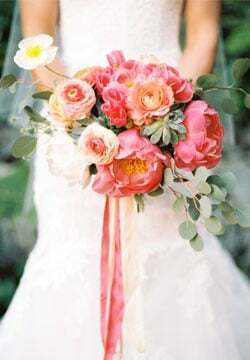 If you had your heart set on peonies, consider some gorgeous garden roses and ranunculus to achieve that beautiful look. This gorgeous bouquet has coral charm peonies mixed with succulents, silver dollar eucalyptus, and poppies. We swoon for this bouquet because it is not only romantic but whimsical. 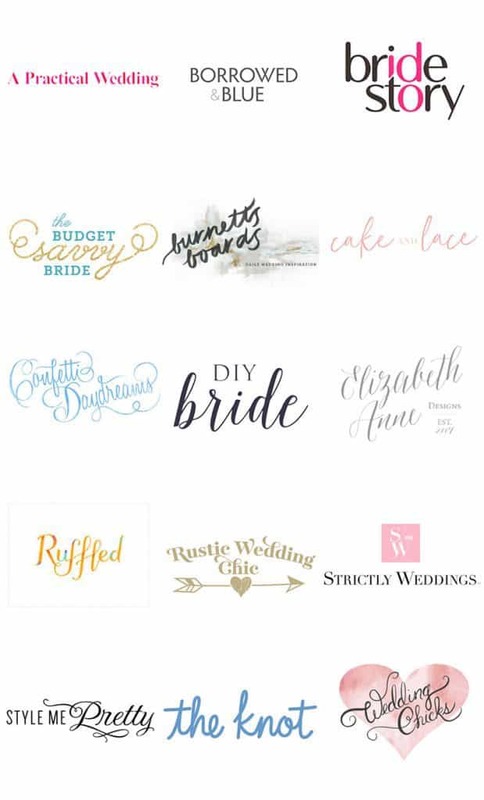 Featured on Style Me Pretty and photographed by Mastin Studio. 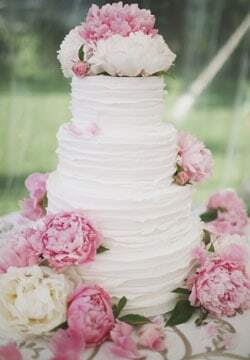 Check out this wedding cake that is decked out in pink and white peonies. This is great for any garden themed event! Featured on Style Me Pretty and photographed by ReadyLuck. This simple yet sophisticated centerpiece showcases lovely red peonies, blush roses, berries, baby blue eucalyptus, and other greenery. We love the softness of the peonies up against the texture of the fillers. This is perfect for a winter wedding event. Featured on 100 Layer Cake and photographed by Danfredo Photo + Films. 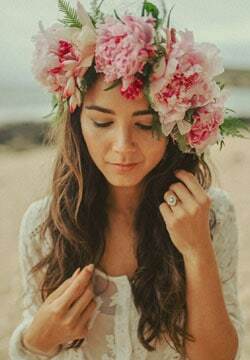 This young lady’s significant other surprised her with a beautiful proposal and floral crown to celebrate the occasion. This statement piece features large pink peonies and fern. We love its bohemian feel and massive blooms! Featured on Green Wedding Shoes and photographed by Chelsea Abril Photography. Here is another amazing way to incorporate peonies into your wedding. Now, show us your peony style!